Cal Poly’s Disability Resource Center (DRC) is more than a means of support for students. It’s also more than a provider for accommodations. The center is an achievement in collaboration, communication, education, and accessibility. Most importantly, it’s making a difference for students in need. McGhee, who has been diagnosed with ADHD, dyslexia, dysgraphia and central auditory processing disorder, is one of more than 1,900 students who utilize the DRC’s services. 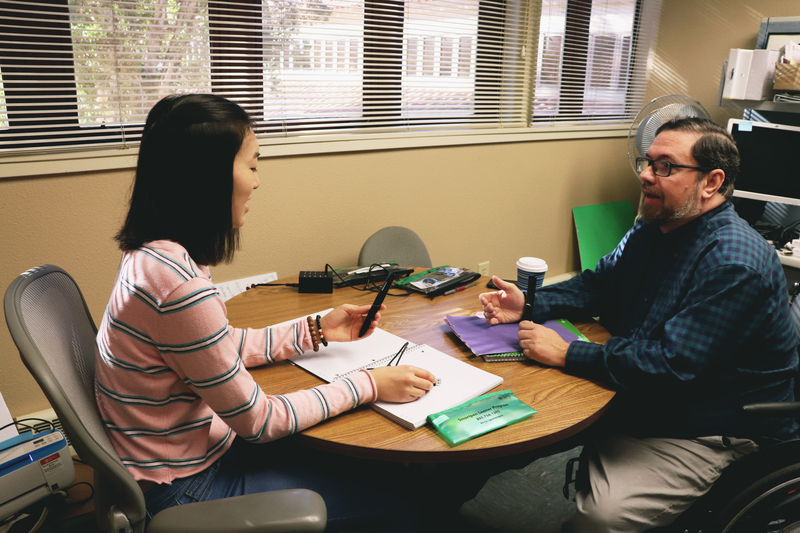 The center’s mission is to make Cal Poly a positive, more equitable experience for McGhee and other students with temporary or permanent disabilities by combining the use of new and emerging technology, individualized accessibility plans, and ongoing communication with faculty. McGhee was diagnosed in high school and considered the disability accommodations of each university during the college application process. Other students, meanwhile, appreciate the DRC’s ability to adapt to their changing needs. Joey Freschet was diagnosed with ADHD during his sophomore year at Cal Poly and at one point, found himself facing academic disqualification due to his struggles with the disability. At the time, he was already receiving accommodations for dyslexia. 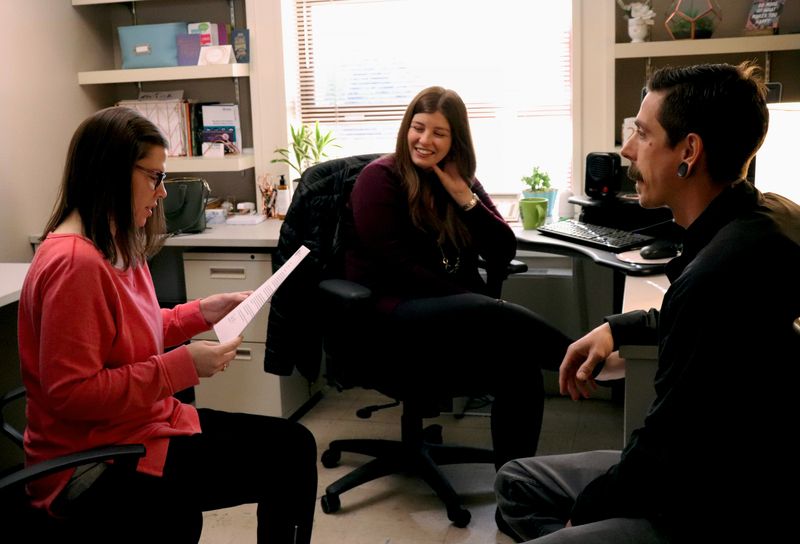 According to Assistant Director Amy Gode, the DRC aims to “level out the playing field” for all students and make a difference in their academic careers. “Students with disabilities have a lower graduation rate than students without, likely because something is getting in the way,” she said of the hurdles facing students with disabilities. Gode noted that the center currently serves about 8.7 percent of the student body. Still, roughly 12 percent of the student body likely qualifies for DRC services, according to the U.S. Department of Education’s National Center for Education Statistics. Often, she added, students simply don’t know that they can receive accommodations. She noted that DRC staff are trained to understand how disabilities affect learning and can offer a variety of options to use that support access. Another common barrier for students, she added, is the stigma of standing out among their peers for seeking help. Gode noted that one of the most popular accommodations requested by students is the LiveScribe Smartpen. The center has more than 300 units currently on loan. “It’s a smart pen that records lectures as students take notes, so they can go back to a specific part of their notes and hear what a lecturer said during that time,” she said. For students like McGhee, whose disabilities make him “a few seconds behind in auditory processing,” using the LiveScribe Smartpen to review a math problem while listening to his professor’s explanation on solving it is the key to studying productively. Not every accommodation provided by the DRC is for on-campus use. Gode noted that for some students, many of the same challenges persist away from the classroom. To that end, DRC offers alternative formats for textbooks, such as accessible e-text, which can be read aloud by assistive technology software such as Read & Write. McGhee added that the DRC already has many commonly used textbooks on file and ready to go, making it easier for students to utilize the service. At the end of the day, Gode noted, the DRC is about helping students reach their potential – no matter how reluctant they might be to receive help at first. For Freschet, the DRC’s willingness to help and work with faculty to get him back on track academically made all the difference in his pursuit of a Cal Poly degree. Interested in supporting the Disability Resource Center and the students it serves? Visit https://studentaffairs.calpoly.edu/givetoday/areas. For additional information about the Disability Resource Center, visit drc.calpoly.edu.